Spa Software | Spa Inc. Eyebrows play a crucial role on the face. They are very noticeable and any subtle differences in the way the brows are groomed can completely change the look of a person’s face. Brows are a feature of expression, and they are closely tied to our emotions. Shaped well, they have the power to change the overall appearance of our faces by lending balance and symmetry. It’s fair to say that not everyone who loses hair on their scalp during cancer treatment will lose their lashes and brows. So whether a person is trying to find out if hair loss on brows and lashes will affect them or whether they are just looking for tips and ideas, estheticians trained in Oncology Esthetics can help. Graduates can offer ideas on how to enhance a person’s features and to create real-looking brows. Oncology Training International (OTI) teaches spa/wellness professionals to work with people living with cancer and during recovery, so they can work with anyone who is concerned about their brows. With just a few new products in a routine and some brow-filling know-how, anyone can have eyebrows that will stand out. Choosing The Correct Colour: Pick a colour in a pressed powder (flat eye shadow with no sparkle) which is closest to the client’s hair colour (whether a wig or not). Tip: Soft to medium brown works well for blondes, redheads and the darkest of brunettes. Brush eyebrows upwards and then smooth outwards. Trim any long hairs if necessary. 1. 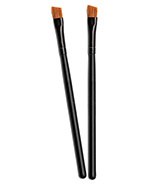 Using an angled brow brush, position it vertically alongside the nose and the inner edge of the eye. Remove any hairs growing in area a. 2. Position the brow brush alongside the nose and the outer edge of the eye. Remove any hairs growing in area b. 3. Position the brow brush so that it passes through the centre of the eye. 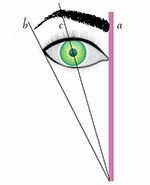 The hairs in area c should be removed to produce the highest point of the eyebrow arch. 1. Ensure the skin around the eyebrow is dry. Take an angle brush, dip it into water, and wipe excess water off on a tissue. Dab the angle brush into the powder to pick up dry pressed powder. 2. Start with small and sweeping movements underneath the eyebrow. 3. Start at the underneath side near the inner edge of the brow and work to the outer edge of brow. 4. Work back and forth with brows on each side of the face. If you completely draw one side and then draw the other, you will have to focus on the shape of the first side. No one’s eyebrows are completely symmetrical. Going back and forth between the brows allows you to make adjustments as you work. 5. This technique will also make a positive difference for any bare patches in the brows. Even if brows are not your specialty, they definitely can make a difference to a person’s psyche, so practice this technique and offer it as an additional service to those with no or sparse brows. Morag Currin is the company owner and educational professional of Oncology Training International (OTI) whose innovative concepts were designed to provide more advanced comforting modalities of esthetic treatments and care for patients undergoing cancer treatments. Editor’s Note: Expert columnist Morag Currin continues her series on how spas can contribute to the well-being of people with cancer, diabetes and other illnesses by providing safe, positive experiences.